Dr. Bashier Hisham Bashier Osman has obtained his MBBS from Al Neelain University, Faculty of Medicine and Health Sciences in 2010. Later he passed his DHA and HAAD Prometric Exam for GP. Dr. Bashier started his career as Medical Professional at M. Alamin Hamid Hospital for Children where he was covering the Paediatric Accident and Emergency Department. Later, he joined HDU unit and Accident & Emergency Department at Omdurman Teaching Hospital in Sudan. Dr. Bashier worked in the Coronary Care Unit (CCU) at Alfouod Specialized Hospital in Sudan to treat the cardiac patients, before joining the Accident & Emergency Department at Sharourah General Hospital, Ministry of Health, Kingdom of Saudi Arabia. Dr. Bashier is a member of Royal College of Physician, UK, MRCP, Part One and Two, and Part One Internal Medicine of Sudan Medical Specialization Board. 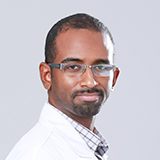 He is also registered as Medical Practitioner by Sudan Medical Council, Saudi Commission for Health Specialties (Saudi Medical Council) and also Dr. Bashier is registered in the Irish medical council as Medical Practitioner. Dr. Bashier is well versed in Arabic and English.